" In Wake of George H.W. Bush's Death, a Thousand Points of GOP Corruption: 'BradCast' 12/3/2018	"
« PREVIOUS STORY "Sunday 'Tough Calls' Toons"
"In Wake of George H.W. 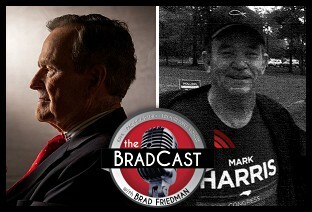 Bush's Death, a Thousand Points of GOP Corruption: 'BradCast' 12/3/2018"
Count me as one of the "dancing-on-the-grave" crowd. Too many crimes to list, but let me just offer two words: WILLIE HORTON. Let me be clear. I would suggest that the one feature of Republican politics that renders so many of its membership impervious to revulsion at Roy Moore all the way over to its rejection of climate science, is racism. Plain and simple. Hatred of the African American is the bedrock of Republican appeal, even on matters where Blacks or other people of color are not even discussed. The delusions that constitute the belief system of the racist mind leave said mind open to all other delusions as long as such delusions serve the purpose of hierarchy, and have the backing of a good couple centuries of practice. George H.W. Bush defended the infamous Horton ad and its success was not lost on the Republican Party when in its efforts to grab "the bigger half" [in the words of Patrick J. Buchanan] of the electorate. Now, where did I put my dancin' shoes? You're a fine dancer, Donald! Not as good as you and Desi, Brad!